District 99 enables you to get cards back from your heap, based on it's design (you need to load it) you want to see it early, because later in the game the value goes down very much. On the other hand you don't want to play 3x in your deck. So usually you use it as 1x which generates value when you can find it early, otherwise you don't use it. But how to load it? The most obvious possibilities are MaxX: Maximum Punk Rock (yes her ability is loading District 99) or Inject (only trashing programs) and Patchwork that was also released in R&R. I think outside of MaxX the use is to niche to reliably load it, so I can't see other IDs using it. On top of Maxx it should be paired with Patchwork so you can trash cards to Patchwork to load your District which makes it more reliable. 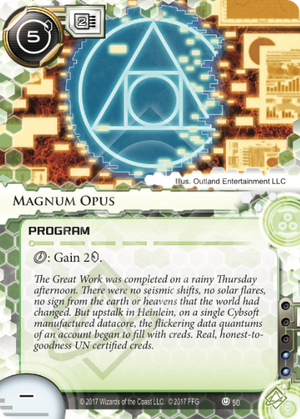 On top of that, the strong dominance of the bin breakers (Paperclip, Black Orchestra & MKUltra) makes all of the mentioned cards strong! They allow you neat tricks, like run on a server, install a program from your heap, using the discount from Patchwork by trashing another bin breaker. Get the missing breaker in the bin in case you need it & get your District counter. Without the bin breakers, e.g. for rotation, I can't see a proper use case scenario. 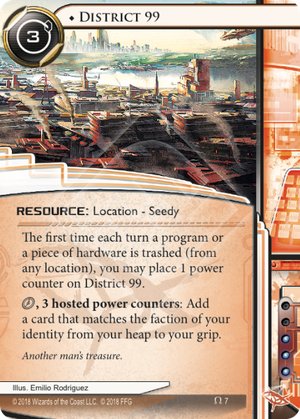 So as a summary, this cards best use case is Maxx & Patchwork. What to recur with it? 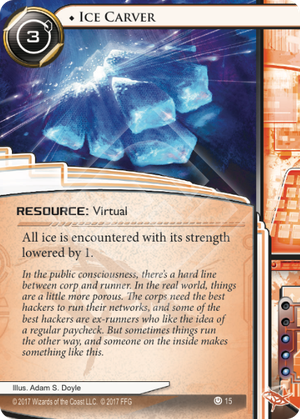 Only cards in faction, so the obvious choices are cards that MaxX: Maximum Punk Rock milled, that might be important for you, like Patchwork, Ice Carver or to replay Hacktivist Meeting. Or economy cards to reuse them again. Lot's of economy cards are neutral, that leaves Liberated Account, Stimhack, Day Job or Guinea Pig. Other options are: D4v1d, DDoS and The Archivist. Splashing it into other factions doesn't seem to be that beneficial, but in theory you could pair it with Aesop's Pawnshop but this would need enough programs and hardware to sell to it. Or maybe a criminal deck with those terminal directive breakers (Abagnale, Lustig and Demara) and or Spy Camera and Sports Hopper hopper to have further Diversion of Funds and recursion. But that already seems janky. I've tried to make this card work (in a competitive environment), without success in a Patchwork Maxx deck, but I'm not that experienced in playing Maxx too. Personally it never felt good to use 2 clicks to get Liberated, install it again and use it then. But this might only be a feeling. Additionally to that, the card must justify itself. What are you cutting? 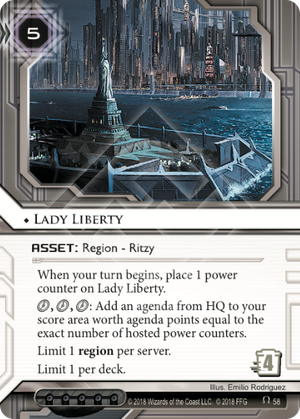 An economy card? Something else? So I would say, you would need to use it at least twice during a game to make it better then the other card you have skipped for it, and there I see the major issue, as it means you need to see it early to get at least 6 counters. On top of that it also costs you additional clicks to use. That is why I think it's not as good as it seems first glance.